So Much For A Vacation Away From Candy! Working in a building full of thousands of candy items to some might seem like the ultimate dream job, but to those working daily in the wholesale candy industry like myself, it can get a little too sweet at times! This past week I took my annual summer vacation to south Florida for some much needed R&R with my friend. It was wonderful to smell the ocean breeze instead of the sweet candy aroma I work with everyday. My friend was also enjoying the fact that she didn’t have to hear for once about a new candy item I was about to put online lol. I think I was about 24 hours into my vacation and wouldn’t you know it, we walk off the beach and walked right into the largest moving snickers bar we have ever seen. For some reason I even thought I smelled the peanuts, caramel and chocolate. I stood there laughing, as if I was almost being followed. My friend got a chuckle out of it as well. As we both stood their laughing and staring at this big candy bar, we noticed several people staring at us as well. I could tell they almost thought we were nuts for even wasting the time to look at it, let alone snap a few pictures! Little did any of them know that I traveled 1300 miles to get a rest from snickers bars or any sweet candy treat! 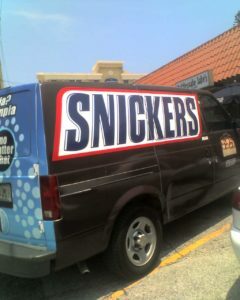 I’m still trying to figure out if the owner of this van is just a fan of the snickers bar or if M&M Mars is possibly gearing up for some new mega sized product and needed me to see it. Regardless, it had me once again thinking of what I do daily. I guess that’s not a bad thing considering, without my job selling thousands of candy items to you, I wouldn’t have any money to take a vacation away from it all!